Are you someone who will happily spend days sprawled on your sofa watching TV? Or could you sit in the same spot for hours with only a computer game for company? If you answered yes to any of the above questions, then the future of human space travel could rest with you. 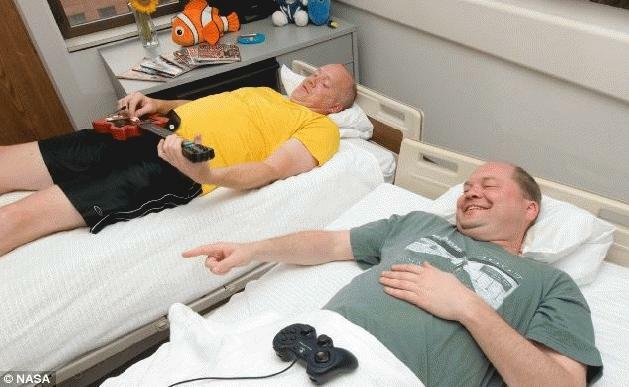 Nasa is recruiting volunteers to lie a bed for 70 days to research the effects of microgravity on the human body. And the study, which is on-going, will give you around $5,000 (£3137) a month for the pleasure. The study takes place at the Johnson Space Centre in Houston where you stay for two weeks, doing every day activities, so that scientists can monitor your body in normal conditions. You then spend 70 days in a tilted bed where you will have light for 16 hours per day and darkness for eight hours per day. Access to computer games, TV, books, the internet and visitors is permitted, and all food is provided to keep you at a constant weight. You can even get a shower while you’re in bed. The only time you can move is when scientists carry out tests to find out any changes in bone, muscle, circulation, nutrition and the immune system. Or as part of the newly-introduced exercise called the ‘countermeasure and function testing’ study, that will monitor how different movements can effect muscle size and strength, bone health, and cardiovascular function. Even then you will be lying in bed and will exercise on specially-designed equipment. Following 70 days, there is a 14-day rehabilitation period to get your body back into shape. A similar study is being undertaken by the European’s Space Agency’s (ESA) Programme for Life and Physical Sciences at the Medes Institute in Toulouse, France. But while it may sound like easy money, it isn’t the walk in the park that it might first seem. During extended periods, microgravity takes a serious toll on the human body. Without the pulls of normal gravity, blood doesn’t flow downhill, but pools in the extremities including the face, hands and feet, causing a puffy appearance. And without that downward pressure, height increases. You have to be a US citizen and live within 300 miles of Houston. I am not extremely claustrophobic, but I am little-- and most of that is about the freedom of movement. Lying in a bed is fine as long as I feel like lying in bed, but if I do it for too long my back and legs begin to ache and I must get up and stretch. I would do it, but I don't live close enough. so long as nasa is running the program, you can rest assured that you are going to be more than comfortable (even when they tilt the bed so that you are laying head down)... these are the guys that created the memory foam beds after all. however, just to clarify... this particular program that they are conducting has been taking place at it's current location since 2005 and has already existed for decades. as for claustrophobia concerns... it's not a concern. For sure everyone would like to join this trial since that only thing that do by the patients is to lay in bed, but I like the study of scientist for this trial because it determined the changes of function of bones, muscles and cardiovascular without doing any activities and it also show how important is exercise in our body and health.